House Science Space and Technology Chairman Lamar Smith (R-Texas). Photo by Bill Clark, courtesy of AP Images. In an interview with E&E News yesterday, former National Oceanic and Atmospheric Administration principal scientist John Bates had a significantly more nuanced take on the controversy that has swirled since a top House Republican hailed his blog post as proof that the agency "played fast and loose" with temperature data to disprove the theory of a global warming "pause." "The issue here is not an issue of tampering with data, but rather really of timing of a release of a paper that had not properly disclosed everything it was," he said. Bates, who recently retired from NOAA's National Climatic Data Center, claimed in his post that the agency rushed research disproving the global warming pause to publish in Science magazine before the December 2015 Paris climate talks. Climate skeptics have called that proof of massive fraud among federal climate researchers and said it allowed world leaders to be "duped" into signing the Paris climate agreement to reduce carbon emissions from fossil fuel use. Bates said the NOAA study relied on land data that were "experimental." Typically, NOAA officials can publish research that relies partially on experimental data, as long as the data are properly identified, especially if there is an urgent situation that requires something to go out quickly because it is related to human health, safety and the environment. The publishing safeguards are important, he said, because they help protect federal research against lawsuits. Bates added that science suffers if its results cannot be reproduced. Yesterday, the House Science, Space and Technology Committee portrayed Bates' allegations as a bombshell that required immediate investigation. Former National Oceanic and Atmospheric Administration meteorologist John Bates says the agency broke its own rules for scientific integrity when it published a study debunking the "hiatus" in global warming. Photo courtesy of the American Geophysical Union. 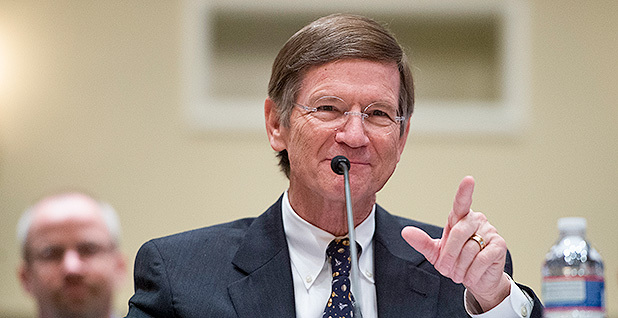 Committee Chairman Lamar Smith (R-Texas) has issued subpoenas and has for nearly two years attempted to obtain scientists' emails involved in the global warming pause research. A Science Committee aide yesterday said Bates' revelation was evidence that NOAA needed further investigation because its own employees were identifying significant policy breaches. The aide said the committee would again seek the emails of federal researchers, and if a formal request were ignored, another round of subpoenas could be issued or scientists might be forced to testify in front of the committee. "I think the brushback that the committee received, and the chairman received consistently, about how science is capable of policing itself and doesn't need anyone outside asking questions, even when the science being discussed is paid for and performed by scientists paid for with the taxpayer's money and used to implement far-reaching federal policies or justify implementation of far-reaching federal policies, doesn't really work," the aide said. Bates laid out his claims, which are largely technical and related to the sharing of data, on the blog run by Judith Curry, a climate scientist who has broken with many colleagues and called into question the actual extent of humanity's influence on the planet. The report's authors, Bates wrote, put a "thumb on the scale — in the documentation, scientific choices, and release of datasets — in an effort to discredit the notion of a global warming hiatus and rush to time the publication of the paper to influence national and international deliberations on climate policy." The NOAA administrator under former President Obama, Kathryn Sullivan, refused to turn over the emails because she said doing so could chill the scientific process by making it harder for researchers to communicate openly while they were actively engaged in research. Smith's committee threatened her with criminal charges. The issue is expected to become part of the committee's hearing today into the use of scientific research in crafting federal regulations. Yesterday, a NOAA spokesman did not directly address the specific allegations, other than to say that they are currently under review. "NOAA is charged with providing peer-reviewed data to the American public and stands behind its world-class scientists," said the spokesman, who declined to be named. "NOAA takes seriously any allegation that its internal processes have not been followed and will review the matter appropriately." Whether the research was published to influence the Paris climate talks is a moot point, said Andrew Light, a senior member of the State Department's climate talks negotiating team in 2015. He said the talks had already been underway for about four years when the paper was published and that 188 nations were relying on a tremendous amount of research to support their goal of reducing humans' carbon emissions to slow the warming of the planet. They had also already crafted proposed reductions by the time the research was published, he said. "I never heard it discussed once, let alone this one NOAA report, discussed in Paris, the run-up to Paris or anything after Paris, so this is really just an incredibly bizarre claim," Light said. For many years, climate scientists were puzzled by an apparent plateau in global temperature rise from 1998 to 2012 as ocean temperatures stayed consistent. The 2015 research paper addressed the issue when it found there was no pause because the method to collect ocean temperatures was flawed. Since then, multiple independent studies have confirmed NOAA's findings, including one published last month in Science Advances. 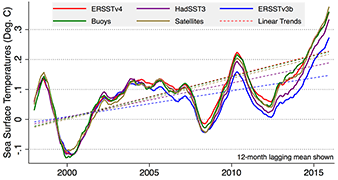 A study earlier this year using data from buoys, satellites and Argo floats backs up a challenge of the so-called global warming pause by NOAA. Graph courtesy of the University of York Department of Chemistry. That study replicated NOAA's findings by accounting for different methods of temperature collection over time. For instance, data collected in the engine rooms of ships show slightly elevated levels of warming compared with those collected by buoys. When researchers accounted for that discrepancy, the so-called global warming pause disappears, researchers found. The American Geophysical Union, which represents thousands of scientists who study climate, pointed out that the results of the 2015 study had been discussed in peer-reviewed journals and that multiple studies had independently backed up the findings. The reports do not change the fundamental understanding of climate change science, AGU President Eric Davidson wrote in his blog yesterday. "These types of statements by policymakers that attempt to take one study/dispute and blow it out of proportion are both unhelpful and misleading," he wrote. "We will be working with the science committee to demonstrate the scientific consensus on climate change and to encourage them not to interfere with the scientific process." Yesterday, Bates said he was contacted by the Science Committee for the first time only after the story broke. He said he has not communicated with anyone there before and was not a whistleblower for the committee previously but that he expected to be invited to Washington to testify at a future hearing. He said he would accept such an invitation, but cautioned scientists against advocating policy. 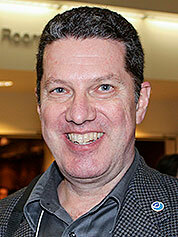 "You really have to provide the most objective view and let the policymakers decide from their role," Bates said. "I'm getting much more wary of scientists growing into too much advocacy. I think there is certainly a role there, and yet people have to really examine themselves for their own bias and be careful about that."